With greater coverage than any other resource, the Encyclopedia of U.S. 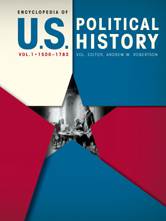 Political History identifies and illuminates patterns and interrelations that will expand the readers understanding of American political institutions, culture, behavior, and change. Focusing on both government and history, the Encyclopedia brings exceptional breadth and depth to the topic with essays for each of the critical time periods covered.